We have been living in our new house for almost a whole year now and since we are settled I’m at the point of making it more functional for our family. 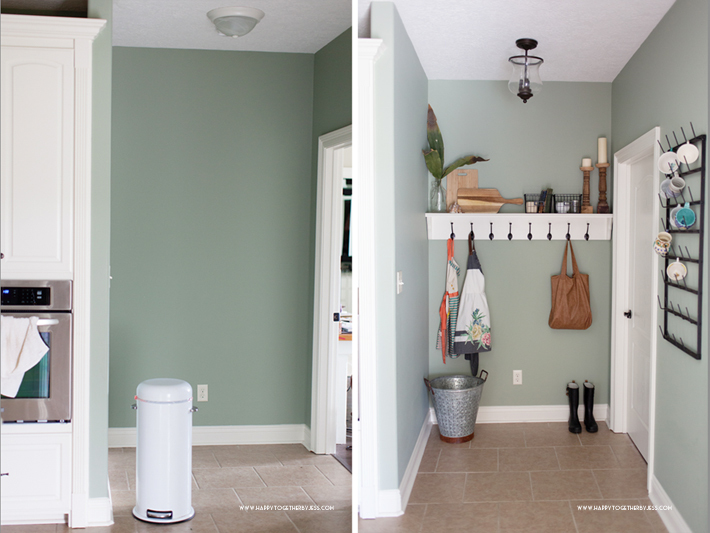 I want to share a simple kitchen nook makeover that I did to bring purpose to an empty spot in our kitchen. This spot is a good amount of space but had no purpose so it seemed like wasted space. It is right where the entry of the master bedroom is, so I knew I didn’t want to fill it up too much but it needed something. After going through a few ideas, I decided that a simple shelf with hooks would work well. 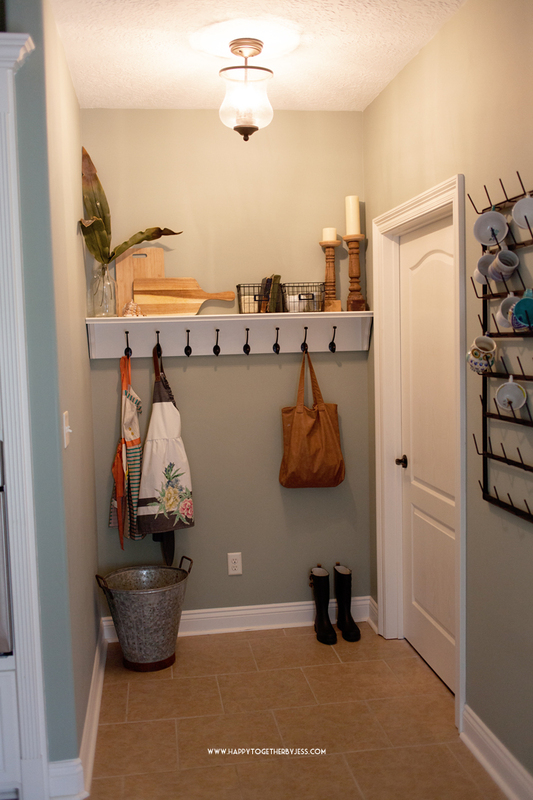 We have an area in our laundry room that is kind of like a mudroom but I haven’t put up any hooks in there for coats and such yet and dedicated this space for that instead. 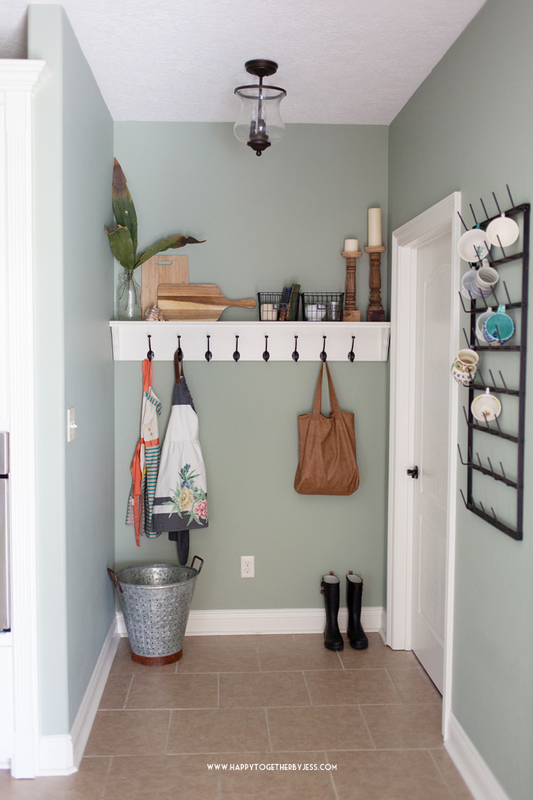 This really works best for guests as well since they come in the front door and it would be more practical and easier for them to hang purses/coats here if they wanted. I wanted to add some beauty to the functionality of the corner and went “shopping” in my house for decor. This glass jug was from a jug of apple cider we bought last fall in Tennessee. I washed it real good and took the label off and it became a great vase. The faux leaves were a buy from many years ago at a shop in the Outer Banks of North Carolina. The style I try to achieve in our home has a slight Florida feel. It’s kind of hard to explain, but I know what I want in my head! hahaha I grabbed two wooden cutting boards to add up here too. We have been using these really thin plastic boards lately, so I figured why not just use these for decor until we need them? I want to get one more larger round one to be the finishing touch behind these two. It will help fill in the gap between the boards and the baskets. 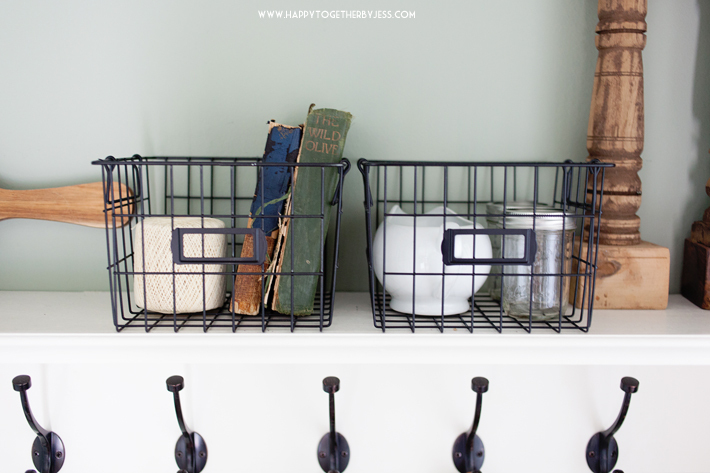 These two metal baskets were originally a mint color. I had bought them in the dollar section at Target for $3 each a while back and was waiting for a way to use them. They were the perfect width for this shelf! I spray painted them black to go with the color scheme though. I filled them with a few odds and ends from my home for now until I want to change them out. 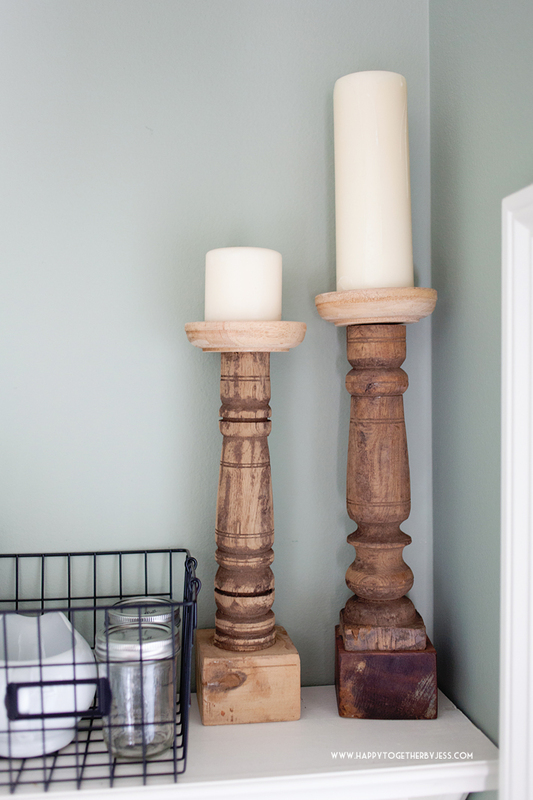 These two wooden candlesticks were from my visit to Magnolia Market at the Silos. I loved them but didn’t really have a place for them yet. They looked too close in height next to each other so I added two different sized candles I had to create even more of a height difference. 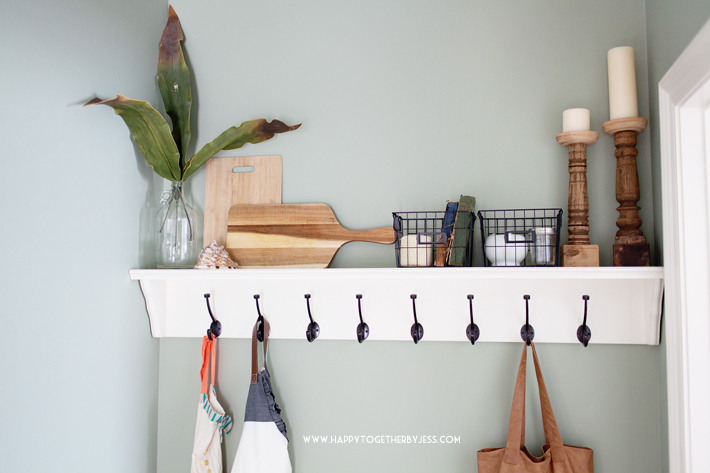 I made the shelf itself from 1 x 8 pieces of wood that I painted with Sherwin Williams in Creamy (7012). This is the trim and cabinet color in the kitchen. It looks more white on the shelf than it does on the trim so I’m guessing it has to do with the kind of wood used. I added a piece of trim to the front edge to have it fit in with the woodwork of the house more as well. The wood brackets I used were from a local store called Stines and I cut the bottoms off to make them the same length as the wood. 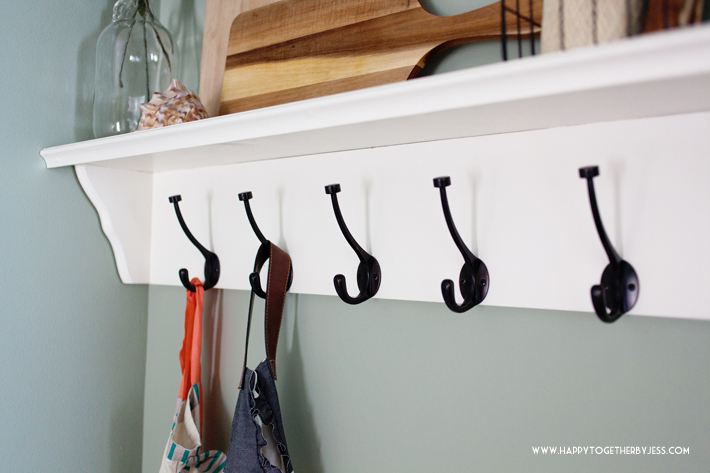 The hooks are from Lowes here. They are a nice dark bronze which goes with all the fixtures in our home. 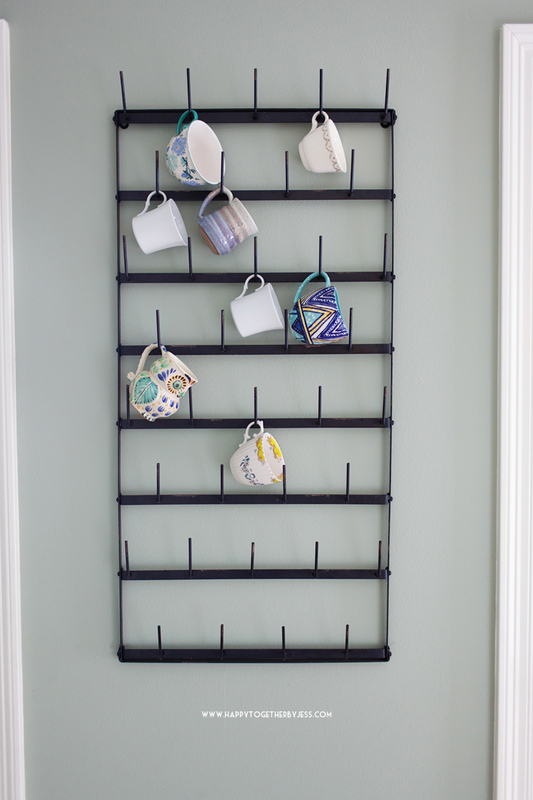 I added this “Cups for Days” mug rack that I also got from Magnolia Market. It’s something I have wanted for a while and after looking around on the internet I decided their price is really comparable for all the ones I found in this similar size. It was definitely a splurge, but a classic piece that maybe one of my girls will like and use in their own houses later down the road. It is currently holding a few of my coffee cup collection from Anthropologie along with some other mugs I have. My goal is to have an extremely eclectic variety of cups and plates so I buy at least one mug and plate a year from there. And lastly we changed out the boring old light with this one from Lowes. I’m saving up to add this same light in our hallway to bring some cohesiveness to my light fixtures. The people who built this home used a variety of builder grade lights, you know, like how many cheap light fixtures can we add? kind of lights. Blah. I’ve been slowly replacing the ones that are most obnoxious (to me) first. 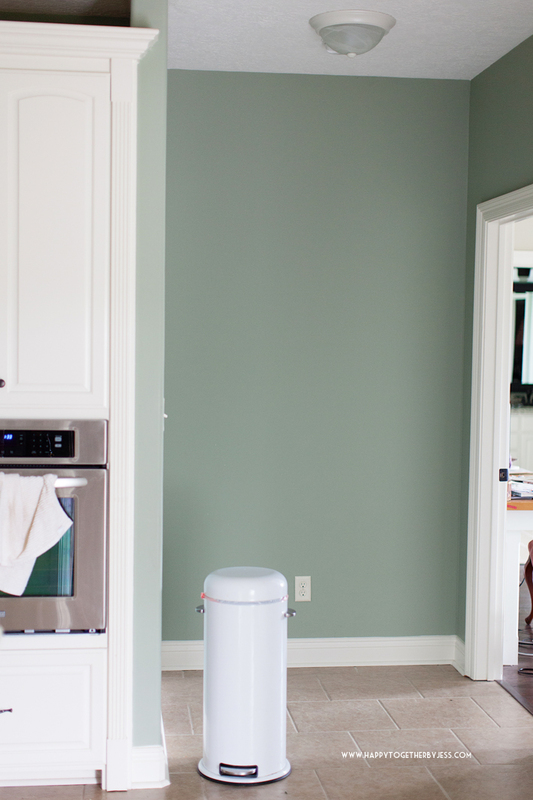 Oh, and in case you wanted to know, the wall color is Willow Tree by Sherwin Williams. 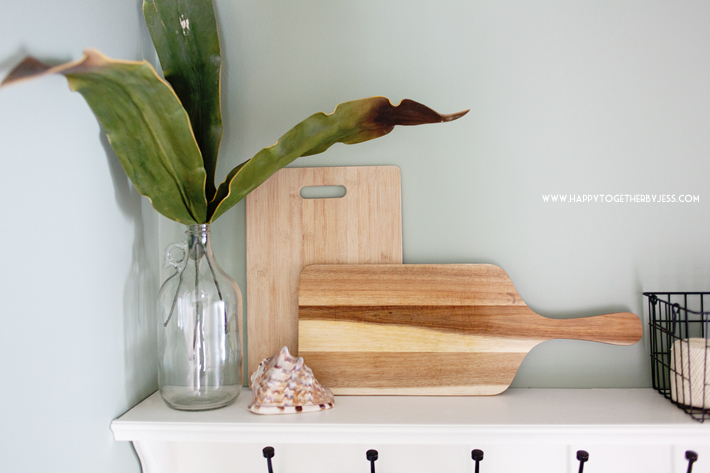 I’m so pleased this little kitchen nook makeover has brought more life and style to the kitchen and of course much more functionality! Now for the next spot in our home that needs some love…..
Me encanta todo lo que haces, tan sencillo pero tan bonito.